Technological advances and digital devices have had a huge impact on a variety of careers and industries. One industry where that is extremely obvious is marketing. The entire field has been forced to evolve and find new practices and techniques to keep up with today’s digital trends and technology. This has also brought about new positions in digital marketing. While it still uses many of those same marketing foundations and principals of the past, it has also taken a unique approach to marketing by taking into consideration people’s reliance on digital devices. If you’ve been considering a career in digital marketing but aren’t exactly sure if it’s right for you and what it entails, then you’ll want to read on. One of the first things worth noting about digital marketing is that marketing as a field is one that is currently enjoying a healthy amount of growth here in the United States. According to statistics from the United States Bureau of Labor, advertising, promotions, and marketing managers are growing at an above-average rate in terms of positions, and the median pay is $127,560. If you’re basing your future career on how many jobs are available, then clearly marketing is an industry worth taking note of. Another big pro in choosing a career in digital marketing is that statistics show it’s one of few careers out there that actually encourage and allows for a healthy work-life balance. Having a great career that is fulfilling and interesting is important, but just as important is having a fulfilling life outside of work. Many of these digital marketing positions also make it possible for the person to work from home and even have flex-hours, which again, encourages a healthy work-life balance. If you're the type that gets bored easily, then digital marketing could be exactly what you need. This is a field that combines social media, paid advertising, emails, building brands, and creating shareable content. It's fresh and new all the time, making for a dynamic and engaging career. It’s not just the job responsibilities that offer variety, there’s also variety in terms of employers. You can choose to start your own company, work for a marketing company, or as part of a company’s in-house marketing team. Of course, in order to excel in a career, you'll need the proper educational training. You'll find digital marketing courses are easy to find and enroll in, which means you can get that dream job that much faster. General Assembly is a great example where you can find campuses located all around the world. 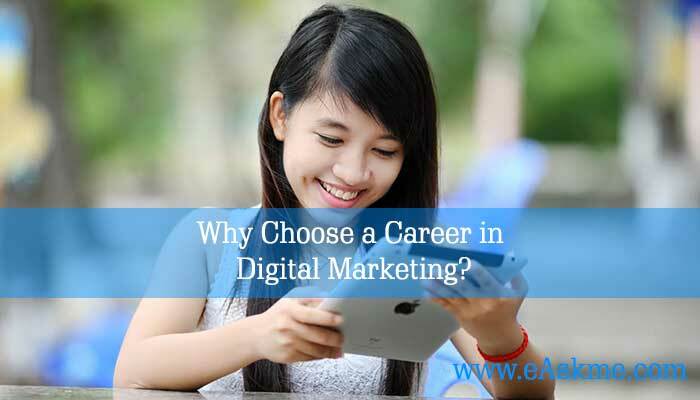 Digital marketing is a career that offers plenty of promise, versatility, variety, and opportunities making for a great option for a wide range of people. Look for this industry to continue to evolve and expand as technology drives it forward.